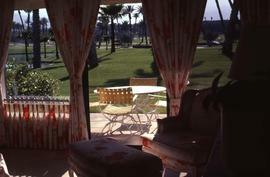 Colour Kodachrome 35mm slide depicts a patio with pink curtains looking out onto a golf course. The Desert Horizons Country Club is in California so this slide may have been mislabeled. Photograph depicts the Point Grey Golf Club clubhouse.Expansive fairway in foreground of image, dotted with trees; white, two storey building in middle of image, with trees behind. 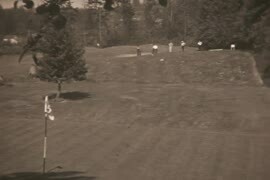 Photograph depicts the Point Grey Golf Club grounds.Expansive fairway in foreground of image; sand trap and trees in background.